Stoffy and Dayne83 like this. I need more bench space. What is that lovely retro machine in the first picture, i.e. sm_001? They all look in such nice condition as well. Wow...I am loving those! 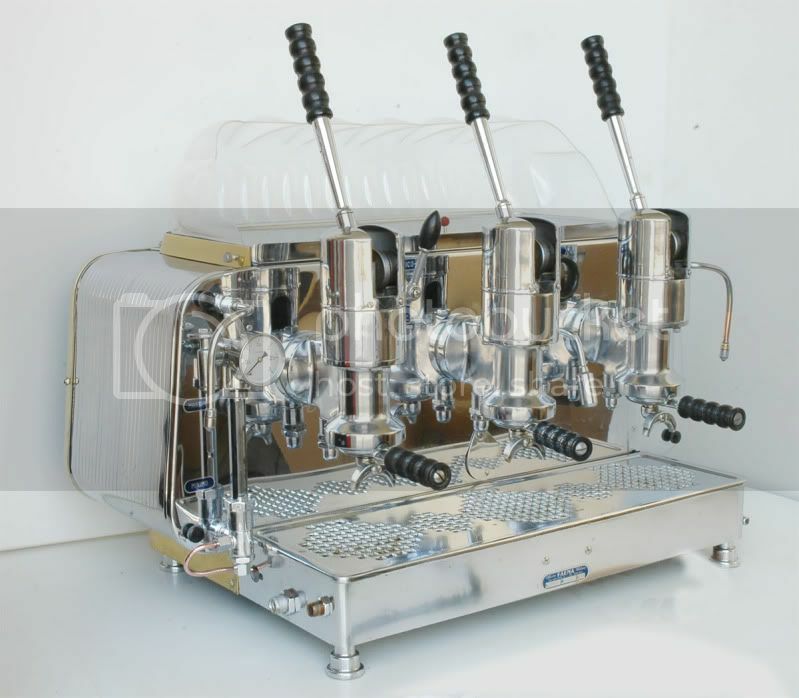 Please stop posting up such pictures because Im now hatching plans to rip off my FAEMA side panels and stick on chromed steel sides instead, and perhaps adding spay paint....arrrgghh!!! 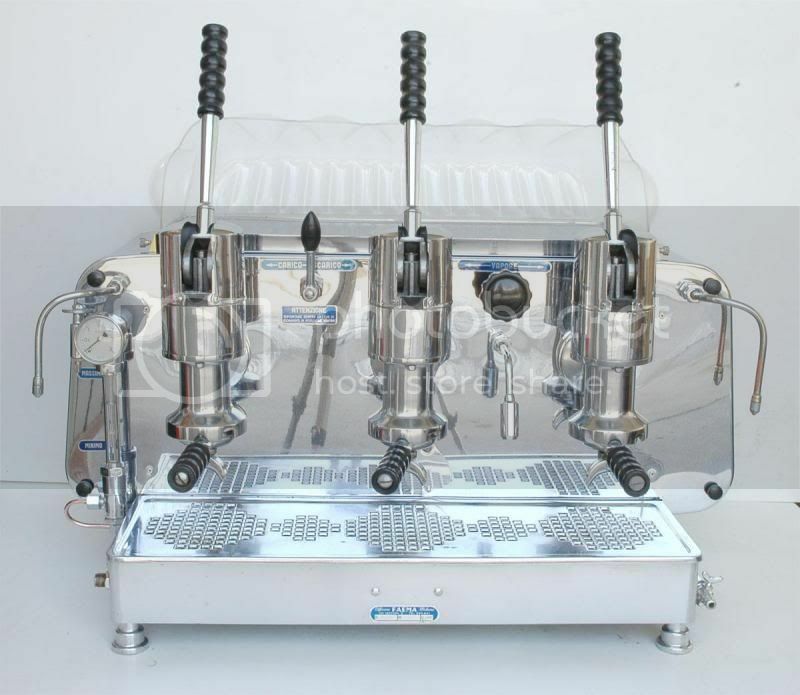 Hi, do you still have the Rancilio or did you finish up selling it? Are parts often difficult to source? Another Aurora. It must be one of the very first as it has no heat exchanger. Have successfully tamed overheating by replacing the boiler/ grouphead gasket with a PTFE one. Now makes a great coffee. A Conti Princess from the early 60s. Pictured as I received it. Only 1/2 renovated at the moment. Love that stirrup handle. 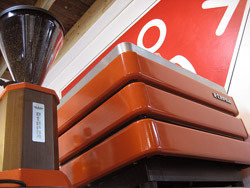 anyone noticed the beautiful 1950s faema urania on the bay of evil? Sure did! Wish I could find the cash for it though - so beautiful. 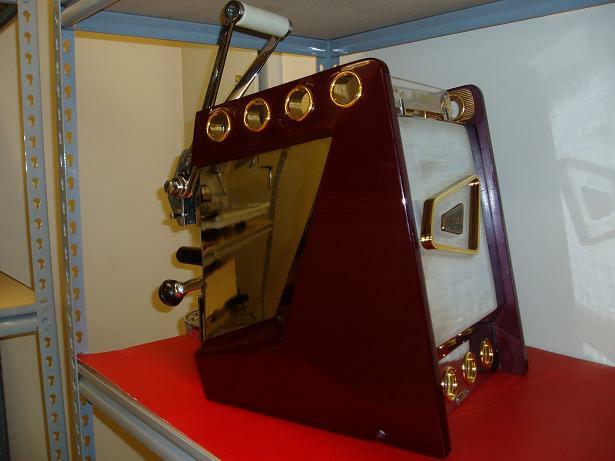 The Maling Room have a restored 1957 single-group Faema (not sure if it is a urania) that is a work of art - so beautiful! 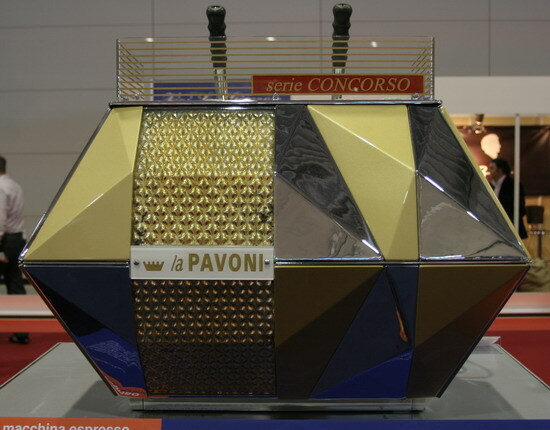 I especially like the La Pavoni, I have a soft spot for them (been looking for one to restore as a first project). The Urania is back on the bay of evil. Failed sale last time. To add to the collection of Rancilio Z9s above, heres mine. 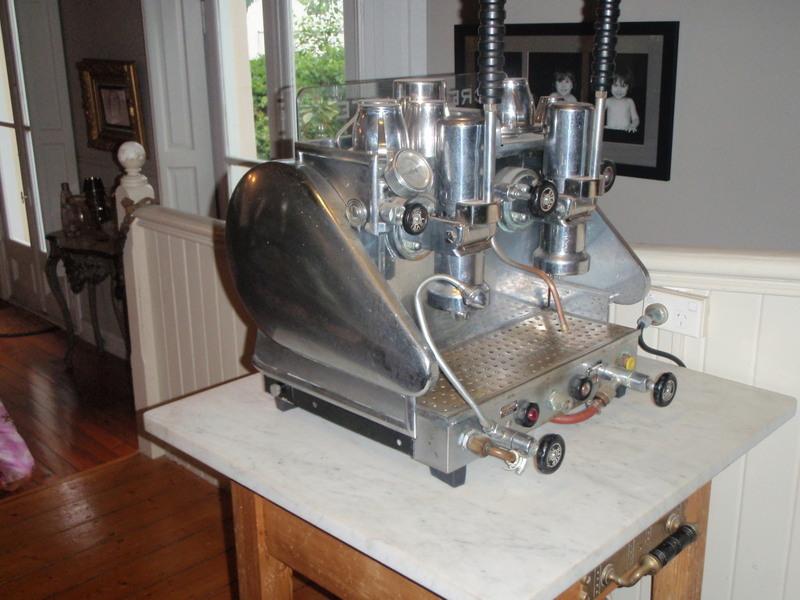 Its my primary machine, taking up a good proportion of my tiny Sydney-inner-west terrace kitchen (the base you can see in the photo is the dishwasher). 1984, black, single group. Im not sure it had ever been cleaned before I got it. Like beanflyings project (hows that coming along, by the way?) 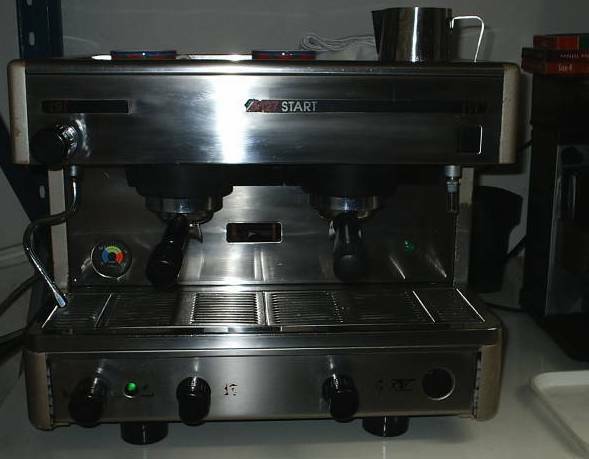 I bought it for next to nothing on ebay, stripped it down, cleaned it up, replaced a bunch of stuff thanks to the folks at coffeeparts, and its working well. For real restoration points it would need a proper sandblast-and-repaint job, but thats out of the question on my current student income. 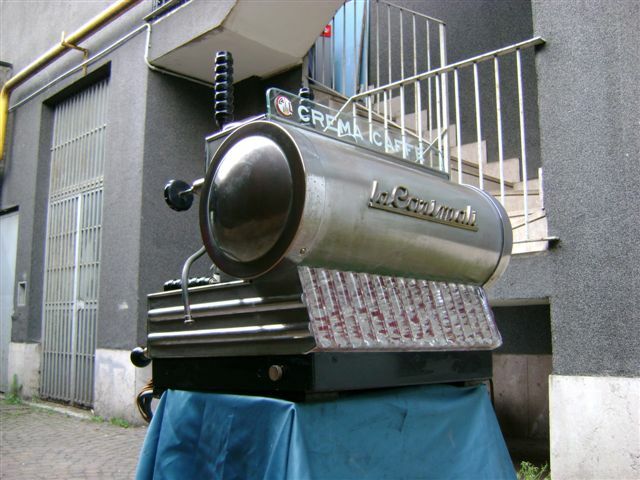 Despite Attilios dire warnings of burnt coffee, as is historically the case with these machines, its not been a problem at all. someone just emailed me this. 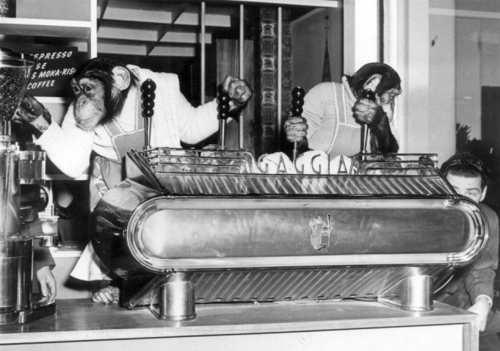 its a photo of andy and i making coffee!!!!!!!!!!!!!!!!!!!!! 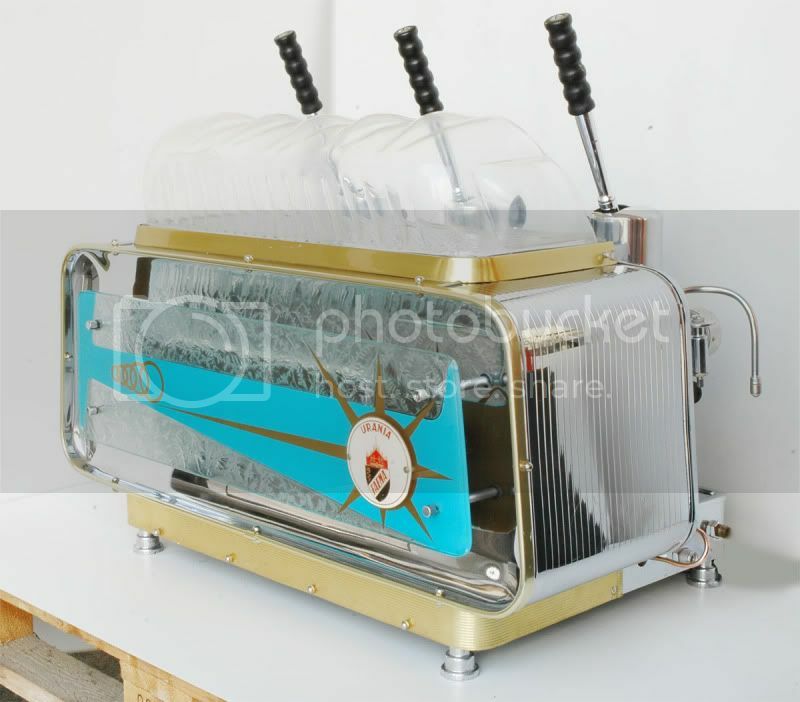 Hi, does anyone know what a 1979 LA CIMBALI LEVER 2 group in working order might be worth these days? 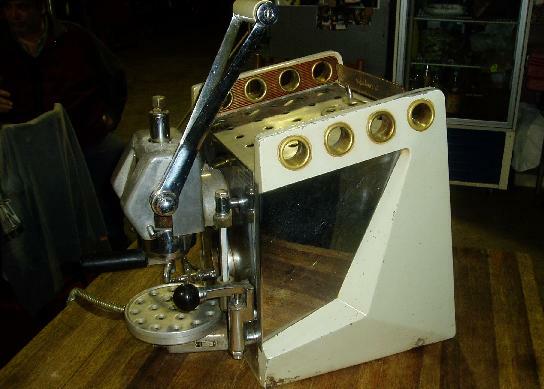 There are a number of restored vintage machines for sale at the moment. They are from New Zealand and available from the bay of evil. They are worth whatever someone is willing to pay for them. Beauty is in the eye of the beholder. Well 1st you have to sort the switch, heat it up, invite us all over to your house and give us your address. 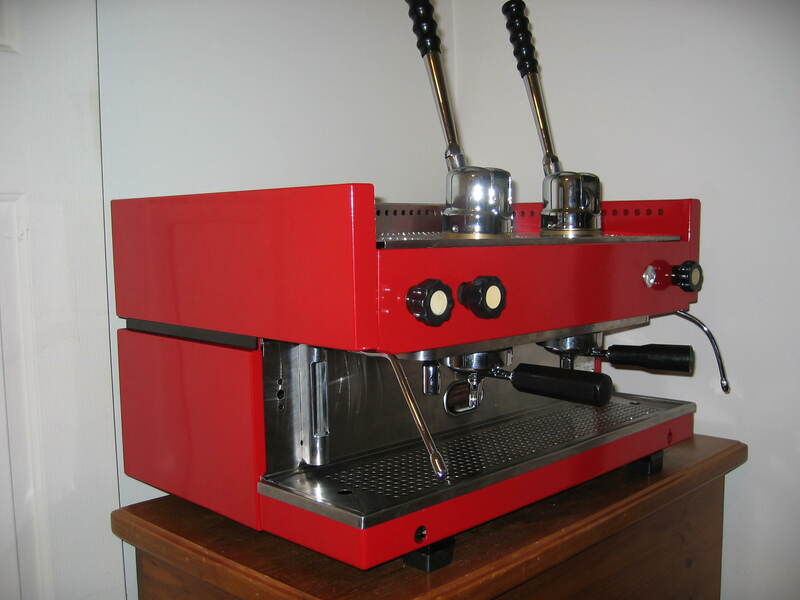 Once we have had some coffee we can provide constructive feedback *:D.
But seriously :) that looks very nice, it sure is RED!! I think this fits in here, I know they dont make em like this anymore! My LaCimbali M27 Start. 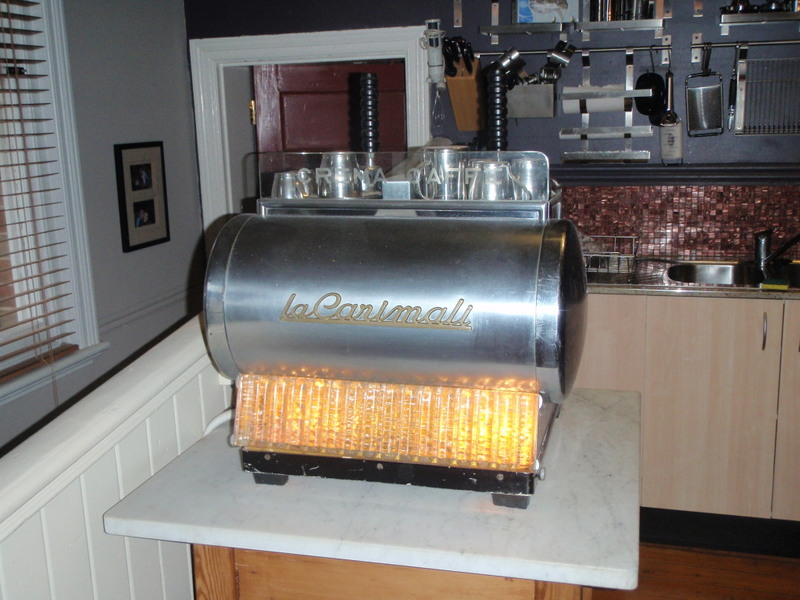 I have a 1950s twin group LaCarimali machine that I have owner for a number of years. 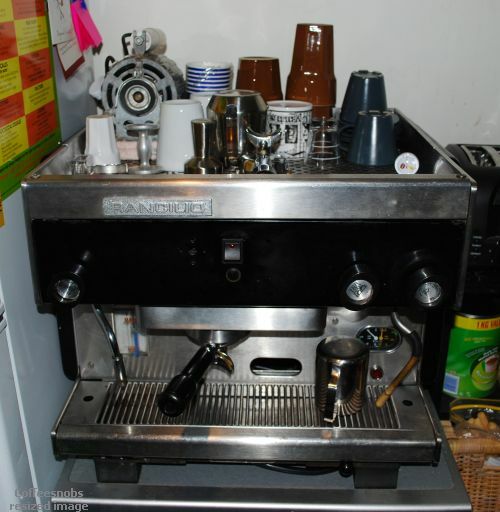 I have had it serviced many years ago and it is plumbered into my home kitchen, however now I would like to get it completely restored. Can ane one recommend someone for this project. I live in the inner west of Sydney. well thats a nice 1st post :) welcome to CS very nice machine. Not sure i would let that out of my sight for to long. good luck with the rebuild, give us some more pics when its done. CS member TCM-geelong might be worth a PM, he has some posts up there ^^^^^ He might put you on the right track. Or a few of the sight sponsors might help. 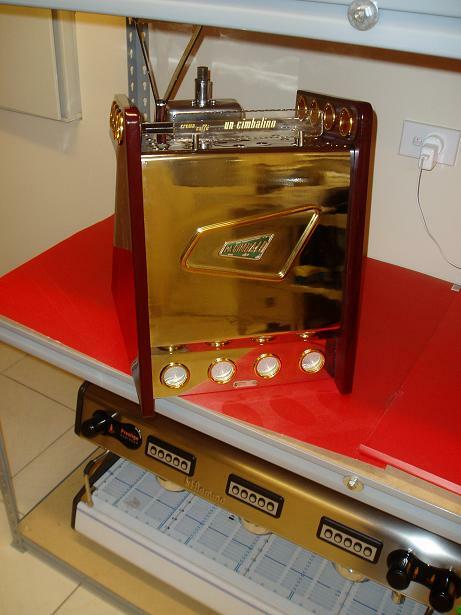 hey very cool carimali, nearly bought one this year but wasnt meant to be. ive restod plenty in my time can definatly help with any info you need. is the murano glass on back in good nic? 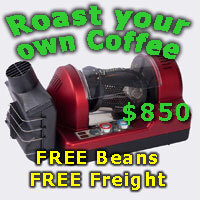 Hi thanks, it is great machine and very functional. I think it has had a pretty easy life so far. All glass pieces appear to be original and in good condition with only a very small chip to the bottom corner of the yellow glass panel and I have the fragment to re-glue. It sounds to me like you did a lot, if not all the work with your restorations, however rewarding this would be, I just do not have the time and am looking for someone to do this for me. 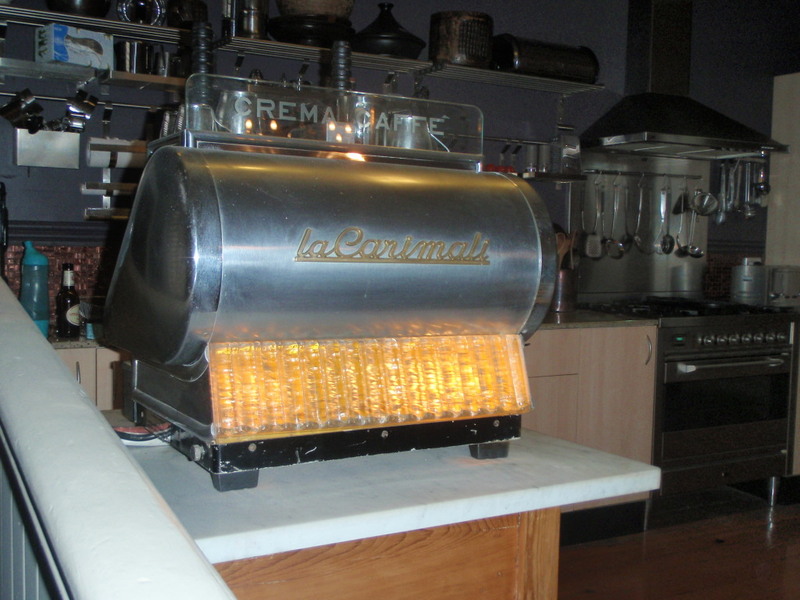 Ooooh, Faema Urania - theres a 1 group at The Maling Room which I assume has finally been plumbed in. Theres also a 3 group in a cafe on Brunswick St Fitzroy. You guys are driving me nuts. 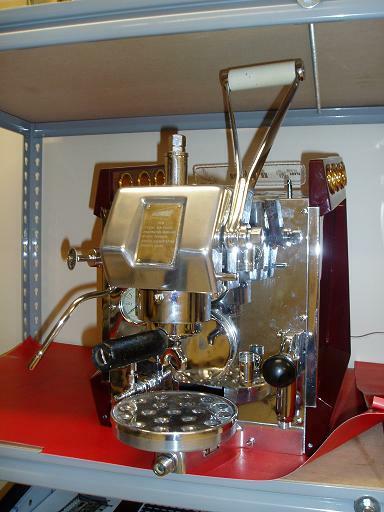 Ive had my scouts out for a couple of months now looking for a single lever, preferably like the Gaggia Classica 1948 model above. Hi Daniel I seen your post and I am really keen to know how the restore went on this? 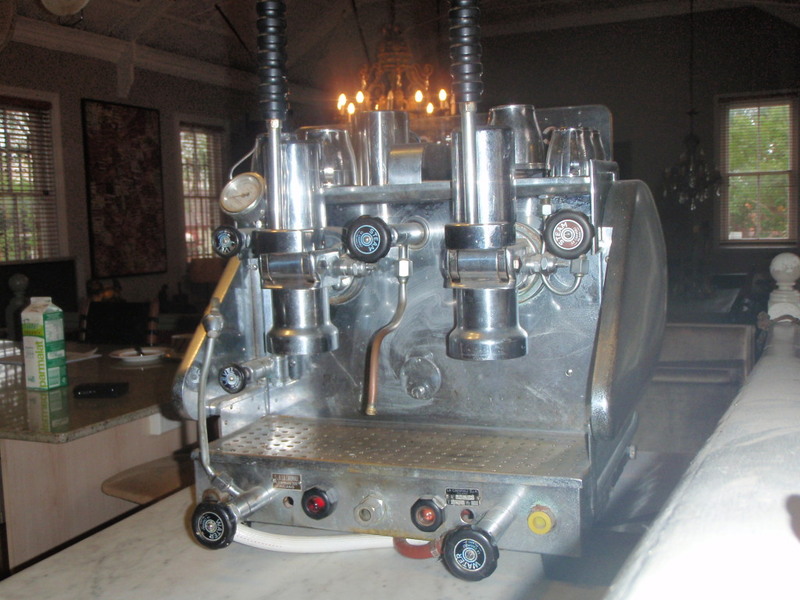 I have the same machine coming from Italy via England in the about 7 weeks and I would like to restore before I put it into service. How did you go with person from Geelong?